Great article on Old Stones in the Chronicle Herald ! Want to join us or donate to the cause? Please go here, any amount is welcomed! 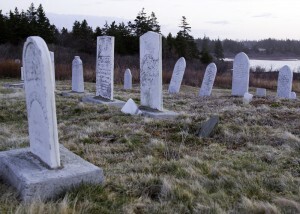 For decades the Founders Cemetery, the Free Will Baptist Cemetery, and the Calvinist Baptist Cemetery in Beaver River and Port Maitland, Yarmouth County, Nova Scotia, Canada were objects of neglect. Most people driving by did not know these cemeteries, overgrown with alders and brush, were even there. In 1999 the Old Beaver River/Port Maitland Cemeteries Preservation Society, under the leadership of the Rev. Ulric Dawson, was formed. The group is committed to the restoration and maintenance of the three cemeteries. The Founders and Free Will Baptist Cemeteries have been restored to the point they are capable of being mowed. Several grave markers have been placed upright. The Calvinist Baptist Cemetery now has a sign and flagpole, and clearing of brush has begun. This website documents the Society’s efforts to restore and maintain the cemeteries, and also serves as a way people may access information about the Society and its activities, and how one may also access information about the residents in the three cemeteries. 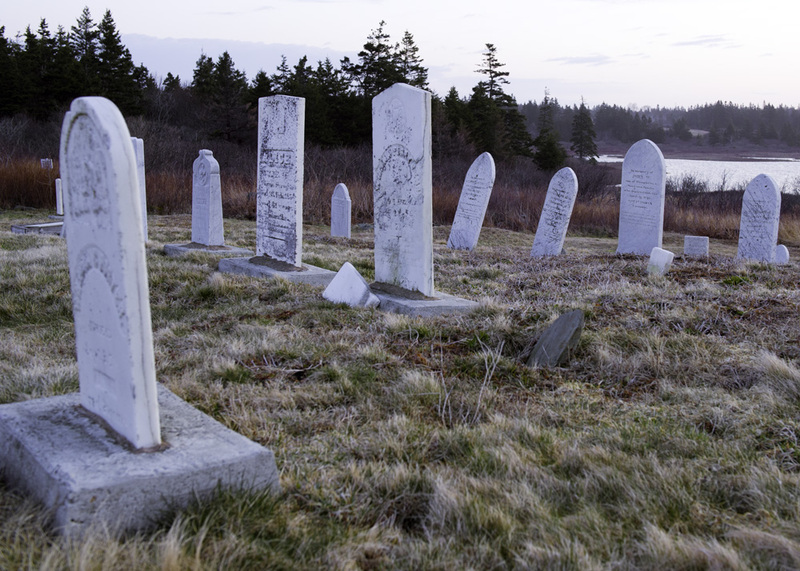 The cemeteries are registered heritage properties in the Province, and many of the residents have interesting stories still to tell, and the information here can provide much genealogical detail. The Old Beaver River and Port Maitland Cemeteries Preservation Society has information about each historic cemetery and profiles online of all the residents in them. You may view information about each cemetery (see the list under Cemeteries in the black bar above) or a list of each of the Residents which then links to a web page for each Resident or Removal and some information about them. We welcome feedback – please send your comments or questions to us, and check back often as we up date the site frequently ! We hope you enjoy your visit to our virtual home, we hope even more that you may someday visit our beautiful area and see history for yourself. Terrific, Thanks for making this website Bill. This site is just wonderful – a dream come true!! For years we have been talking about the possibility of one day having a web site for the Society, and thanks to the efforts of our newest board member, Bill Curry, HERE IT IS!! Thanks to Bill and this site, all the hard work that has been taking place over the past twelve years will be more widely known, and perhaps serve as an example of what can be accomplished by a very dedicated and determined group of volunteers who truly believe in the worth of their work. This has all been accomplished with lots of sweat and tears, and very little in the way of cold, hard cash. All to the end that those buried in these burying grounds will not be forgotten. I’m thrilled to have this welcomed web site for the cemeteries. I’m a desendant of Joseph Sollows, a founder of Port Maitland who is buried in the Founders Cemetery. Your hard work and great effort is to be commended. Thank-you!! Wow! This is an awesome tribute to the dedication and hard work of those who value our heritage. Thank you so much for all you’ve done and continue to do to keep our history alive! The cemetaries themselves have been transformed and revived and are a wonderful walk through history. Thank you all for your passion and commitment! Enjoyed Squire John Crawley’s talk on Sunday, July 24, 2011. Quite knowledgeable for a corpse! The strawberry social and graveyard tour were wonderful events. Mom brought my brother and me along to see the work your committee has done and we were impressed to see the scope of this project. You are an example to other communities with hidden forgotten graveyards. Ebenezer Corning would be pleased. Yes, I too, was fortunate to be home this summer and enjoyed the tour of the old cemeteries (and strawberry social)…..Wilfred Allen (aka Squire John Crawley) made history ‘come alive’. Never realized before, but there are ‘Crosby’s’ in the OLD BEAVER RIVER FOUNDERS CEMETERY …..very interesting!! Thanks to everyone who realize how important our past is – and hopefully will continue for the future generations. I was given this web sight by Cheryl Anderson, daughter of Hazel Trask. Hazel helped me in 2004 when I visited Yarmouth and surrounding areas. My great great grandparents are buried in the old Beaver River cemetery, along with other members of my family, Goldfinch and Jenkins. I am thrilled to be able to see what is being done at the cemetery. Thank you for this web site! I live in Oregon and therefore visits are not too often. I would love to return one day. Bill you’ve done a great job with this website. This makes it easy for those living away to access these cemeteries. I’ve noticed all of the physical work that the Society has done and this just adds to it. Wouldn’t it be nice if more cemeteries could do this. To compliment the excellent work done by you and your Society and to broaden the awareness, I have added you to the Port Maitland.net website. I have visited these cemeteries a few times; very interesting. Good work. first off congrats for a job well done, my wife and her family are from Port-Maitland im sure some family members are there.im sure if anyone done some family tree looking like i have over the years they must! have had to visit this ‘ now great looking grave yard ‘ for some searching. even now i still get a different name to search ,and for me it the story behind that person,that makes the find once found even greater. so again congrats on a job long in the works. Some may remember that my wife Sandy Dennis and I bought Annie D’Entremont’s old house accross from one of the old cemeteries (the very last house in Port Maitland at the end of the Cemetery Road. The house was in “terrible” condition and probably would have fallen in were it not for our two years of hard labour. We brought life back into that old house just as the society has brought life back into the old cemeteries, if that is the correct way to put it. Many times I looked down upon what once was a tangled mess of bushes but just didn’t have the time or energy to do anything about it. Luckily for us that some had the time and energy to devote to the restoration project. Many have already enjoyed the results just as many more will down the road. The board members of the Age Advantage Association/Bridgetown and area community mapping gang thanks you so much for all your time yesterday, your great information and the tours. We hope to see you in September. Wonderful web site. I worked several years at the Port Maitland Beaver River Cemetery back in the early 80’s until I joined the Air Force, and I never knew about these older cemeteries. Great to see how they have been fixed up and cared for now. Next time I’m down from Dartmouth I plan to tour the sites and have a closer look. For my own interest sake, what was the reasoning behind the removals? Why were they moved from one site to the other? Thanks. I’ve been to a couple of your strawberry teas, (DELICIOUS), and a walking tour of the old cemetery. Being a senior, it was difficult to walk on the uneven ground at times and some men were kind enough to offer chairs when we needed them. Greatly appreciated. Looking forward to another “walk” to see the new improvements made. I have a question. My own ancestors were Mennonites who settled the Niagara Peninsula in Ontario in 1799. They came from Penn. Their stones are faded and weather worn and I would like to refurbish them The local historical society will not allow replacement, so I am wondering what you may have done here to preserve or refresh the grave stones. In the future will you include the Lake George Cemetery? The efforts here to do the website and the QR codes took us 6 years, and we’re still working on some of it. I would suggest that if folks like the idea of doing this, they form their own group to do other cemeteries, and I’d love to see one for Lake George. But, the short answer is no, we won’t be extending Old Stones to Lake George. Let me know if you need any help setting up something for your own group, though!